Provocative and controversial, this collection, edited by Charles Brooks, offers the thirty-sixth edition of the most thought-provoking editorial cartoons of the year. Showcasing a variety of viewpoints, the cartoonists satirize headline-making news that defines and shapes the world. Agree or not, these award-winning cartoons are bound to stir your own emotions and opinions, making Best Editorial Cartoons of the Year: 2008 Edition all the more enjoyable. 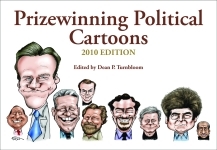 Provocative, sometimes controversial, and always clever, the more than 400 cartoons by some 160 cartoonists in this collection present the sharpest political and cultural commentary on the year’s major newsworthy events. Congressional politics, the war in Iraq, the Olympics, the brutal presidential campaign season, and the historic presidential election of Barack Obama provided ample fodder for the witty wiles of the country’s leading cartoonists. With humor and panache, Nelson tells of her exploits gleaning intelligence while gathering recipes and sampling the local cuisine. Kebabs in Turkey, kimchi in Korea, spargel in Germany, eels in Spain, and Rumbledethumps in Scotland were among the delightful gastronomic surprises she encountered. Dozens of unusual recipes with memorable histories pepper this irresistible memoir of fascinating events, extraordinary corners of the globe, and clandestine culinary pursuits. Now you can walk the streets and view the town without even leaving your chair with The Majesty of Colonial Williamsburg. The main houses, public buildings, and taverns plus museums, crafts, and stores are represented here in more than two hundred full-color photographs. The homes are elegantly furnished in period style, which is shown here in rich detail. Paperback. This interactive guide to our nation’s capital brings the history of the United States to life for young visitors. Short descriptions and pictures of each site remind children to visit the O. Orkin Insect Zoo at the National Museum of Natural History, watch the five-story IMAX movie To Fly at the National Air and Space Museum, and ride a high-wheeler bike at the National Museum of American History. The capital city offers a wealth of activity and discovery for kids, and this guidebook captures every part by allowing them to carry their adventures with them wherever they go. Long famous for its breathtaking natural beauty, the Shenandoah Valley is alive with historic significance. From the two hundred year-old buffalo path that became a pioneer trail to Harpers Ferry National Historic Park to the Blue Ridge Parkway, the Valley of Virginia offers the traveler an array of activities, adventures, and scenic wonders. Paperback. Each section of the book contains descriptions of the awards given and short interviews with the winners. These honored members of the cartoon world view their work as far more than entertainment. They describe their role in terms of journalist, opinion maker, secular preacher, provocateur, and visual columnist. In attempting to influence or illuminate the public, each has made a powerful contribution to the art form.